In the US, the kaki season is almost complete, while in China and Europe the harvest is currently in full swing. Due to severe weather conditions, Spain has 40% less production than normal, although this has not lead to the expected price increases. Worldwide, more and more consumers seem to be discovering kakis: American, European and Australian sources all speak of increasing demand, and many countries see opportunities to conquer new markets. Spain believes that China has a good chance to become its biggest market. The Spanish kaki campaign is not off to a good start for many Valencian producers, who’ve have their crops severely damaged by frost and hail storms. In fact, the Spanish production will be reduced by around 40% due to such climatic adversities. The lack of volume is remarkable this year, as even though there are new plantations entering into production in Spain, they will not be enough to compensate for the volume losses,” says an exporter. However, despite the notable lack of production, prices in the market aren’t as high as they should be, based on the volumes available. The expansion of kaki cultivation in Spain has gone out of control in recent years, and that is why the market is under increasing pressure each year. "There have hardly been any controls on the growth of the kaki acreage, which is the sort of thing that usually happens in this country. When something seems to be working, many give it a try before having the necessary knowledge. Last year, the oversupply at certain times of the campaign resulted in average prices of up to 15 cents per kilo in the worst cases, which does not even cover the production costs. This year, due to the impact of frost and hail, the market could be more balanced, but if the volume is back to normal next year, a disaster could ensue," says the producer and exporter. "For this reason, some growers are already abandoning the crop prematurely. In the future, only specialists and professionals will remain in this business." Although it will be difficult to replace the loss of the Russian market, which was very important for the kaki sector, as it absorbed around 30% of the total exports, the Spanish sector is diversifying its markets in several continents, although the biggest goal is China. "In addition to Europe, we are opening markets in Scandinavia, North America and Latin America, with destinations such as Canada, the United States, Peru or Colombia. These are countries where kakis are still unknown and where interest in them is on the rise, so we see that there is potential. In Asia, we are growing in markets such as Hong Kong and we hope to have an export protocol for China approved soon. That country is already familiar with kakis and consumers there appreciate our variety a lot. It could be the greatest market for us." The sector is still looking for new kaki varieties, and although interesting varieties are appearing, their organoleptic qualities don't come close to those of the Rojo Brillante and they fail to fulfill one of the main objectives: to extend the harvest season. "We are reaching the limit when it comes to extending the kaki harvest period, which so far has been possible thanks to advances in post-harvest solutions and the implementation of better cultivation techniques. A few years ago, we were finishing the campaign in early December and now we are able to market the product until March," says the exporter, who believes that Peru may be an interesting origin in order to extend the campaign. In fact, some Spanish companies are already making investments in this country with such a purpose. According to the grower, kakis are a good, delicious and attractive product, easy to eat and with numerous health benefits. "There is still a long way to go in the kaki sector, but things have to be done right. For example, the campaign should always start with kakis with high enough sugar levels and the ideal coloration to ensure their success and allow the entire chain to keep prices profitable for all. Likewise, a good campaign planning is necessary to prevent moments of oversupply, especially in the first stages of the campaign." The Italian kaki production has not yet tapped its full potential. If we are talking about firm-fleshed kakis (Rojo Brillante), the supply is certainly lower than the demand. The Rojo Brillante kaki campaign has been on-going for about 15 days in central and southern Italy and will continue until December 20th. Prices are up by about 20% compared to last year. The harvest also started in Emilia-Romagna in mid-October. The Rojo Brillante kaki is increasingly becoming a very interesting alternative for producers. However, for the Tipo kaki, the production is expected to record a significant drop compared to last season. "The 2018 campaign is expected to be good in terms of quality and size, especially compared to last year, when we had to deal with an abundance of small sizes," explains the manager of a cooperative. "Now we are back to a satisfactory average size. The quality of the product is high and in this starting stage, the fruit suffers no remarkable problems or defects." Just like in Spain, kaki trees have been subjected to meteorological adversities in the different phenological stages: frosts in April, gusts of wind that caused leaves and fruits to drop, and heavy rains accompanied by high temperatures. The decline in volumes this year does therefore not come as a surprise. There is a stable market for the Tipo kakis, the most traditional and aromatic variety, which is soft-fleshed and is consumed with a spoon. The harvest is now almost complete. The campaign started well, then slowed down a little because of the anomalous temperatures. The unseasonal heat recorded in October has not only caused some problems both in the field and in the ripening stage, but has also had an impact on sales, because the demand has slowed down. Now the market is recovering. The Tipo variety is sold mostly in packs of 2 or 4 pieces. The packaging's cover is essential to protect the fruit and is therefore very popular in the retail channel. In general, kaki prices don't change much from one year to the next. Even if Spain has less product than usual, there will be no price peaks. Young people prefer the firm-fleshed kaki because of its sweet and delicate flavor, its crunchiness and how easy it is to consume. Being able to cut it into slices, peel it and eat it without getting your hands dirty is an added value. It should also be possible to open new markets abroad. The kaki season is still in full swing in the German wholesale market. Despite the good quality, prices are relatively low compared to previous years. The Spanish kaki still has the largest market share by far, although Italian kakis are now increasingly gaining ground within the German wholesale trade. Italy's disadvantage, however, is that its supply volume peaks a few weeks later than Spain. Also, the Sharon is an increasingly interesting product, particularly within the organic wholesale sector. These have been on offer for about 1.5 weeks and are mainly supplied by Spain. After a smooth kaki supply in recent weeks, the volume available is currently declining somewhat, partly as a result of the rains in Valencia. This is leading to a revival of prices. Kakis are currently sold for 5-5.50 Euro (per 5 kilos). According to Dutch importers, a lot of ethephon has been used by growers in recent weeks to make the kakis more evenly colored, so there has been a larger supply of tree ripened kakis with a more even color and taste. An extra advantage for the kakis is that competing fruit have not been too widely available. There is no stone fruit left on the market, there is a lack of good mangoes and grapes are expensive. Thus, kakis are in a good position to attract more interest. A wholesaler at Rungis says that a lot of kakis are currently available on the market. "These volumes are not easy to sell, but in the end, we succeed in selling everything." The trader himself is specialized in classic kakis. "These are much scarcer and so the demand is relatively high." Almost all kakis on the French market come from Spain. The fruit's consumers are mainly of Asian and Latino descent. In the US, the kaki volumes available vary greatly per area. The volumes on the West Coast are considerable, while only small volumes are available on the East Coast. North Carolina has been hit twice by a hurricane in recent months: in mid-September by Florence and in early October by Michael. This has resulted in smaller volumes. "We had a very short season," says a grower. "Furthermore, there are relatively few fruits growing on the trees this year." Total volumes are estimated to be 15-20% lower than in other years. Given that the temperatures started to fall only after hurricane Michael, the fruit also started late with the coloring. Several growers say that the demand for kakis has been growing in the meantime. The prices have also risen slightly. The Chinese kaki season is currently in full swing. The harvest started two weeks ago in Taiwan, Shaanxi and Hebei. In Taiwan, this year production increased due to favorable weather conditions. The demand for kakis is higher than the supply, so the price paid for the fruit has also increased, but only for certain varieties. The prices of kakis from Taiwan and Shaanxi are generally very high this year. For other varieties, the price has dropped compared to last year. The competition is also fierce, as many different kakis are now hitting the market at the same time. There are no large price fluctuations; the price remains generally very stable. The Australian kaki season came to an end in June, when the last batches hit the market. The demand for the fruit in Australia is growing significantly, according to the sector's association, which says that the product has gone from being a niche fruit to becoming a popular one in recent years. 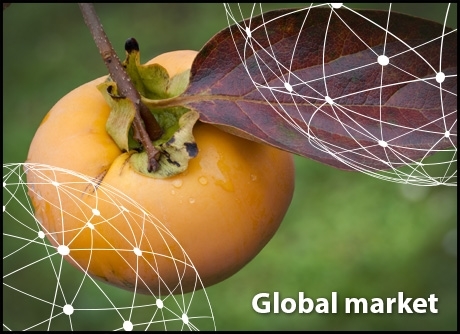 According to Persimmons Australia, the domestic market is growing each year as more and more people are learning about the fruit and trying it. On a national level, there are currently 120 growers who collectively produce around 2,500 tons of kakis a year. The supply this season was pretty much on par with last year's in terms of volume, but in the coming years the industry expects even more fruit on the market, as younger trees in the southern states start becoming productive. According to Hort Innovation statistics for the year ending in June 2017, 2,516 tonnes were produced, and the value of the production stood at $ 10.5 million. Exports totaled just 143 tonnes, with 38 percent of them going to Malaysia. During the late winter and spring, 492 tonnes were imported, mainly from New Zealand. 95 percent of the Australian production consists of sweet varieties, with the main ones being the Jiro and Fuyu. The most important variety of classic kakis is the Hachiya. South Africa's kakis are grown in the Western Cape. The season is now at a very early stage. The orchards have just been pruned and the flowering has just started. The full bloom is expected by mid-November. The water situation looks much better than last year, although kakis have not been as affected by the drought as other crops.